How do you join Team Zebra? 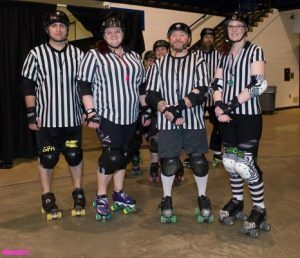 Our Skating Officials, referred to more commonly as Referees or “Team Zebra”, are a dazzling group (get it… a dazzle of zebras?? Ha Ha Ha!). We couldn’t host or skate in bouts without them! Ideally, there are seven Referees officiating a bout. 4 on the inside of the track, and 3 on the outside. The inside referees include the Head Referee, Inside Pack Ref, and 2 Jam Refs (one to track/officiate for each team’s jammer… they swap which team they are tracking at halftime). Outside Pack Refs are the 3 who skate on the outside. The Referees have a big task to do! There’s a lot going on in the heat of a pack, so a lot of eyes are needed to make sure the rules are followed appropriately. Like our Fresh Meat skaters, our current referee team, under the guidance of our league’s Head Ref, train our up and coming referees. 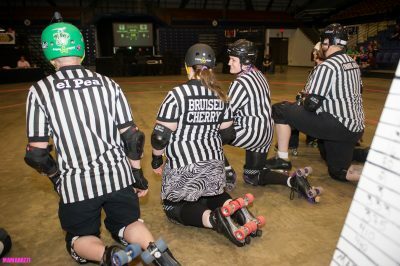 They participate in our practices to some extent, learning basic skating skills, while also learning the rules extensively and how to properly call penalties during a bout. Once the Head Ref feels a trainee is ready, having passed certain skills tests and demonstrated a knowledge and understanding of the rules and proceedures, they can begin officiating bouts! 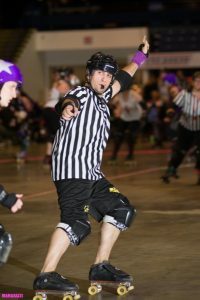 Referees can gain a lot of the same benefits as our skaters such as the workout they receive skating at practices and the camaraderie of joining our derby family. Check out the links on this page for information on gear and our current Skating Officials Staff. If you have any questions or you’d like to get involved, email our Head Ref! Thinking you’d like to get involved, but maybe Skating Official isn’t for you? Check out our information pages on becoming a Doll Starz Skater, NSO (Non-Skating Official), or a Dollunteer!